As demand for LEDs increase worldwide, lighting manufacturers are working around the clock to cater to specific beam configurations, such as wide and narrow beams. This article provides an overview of the narrow beam LEDs market, as well as a summary of complex obstacles that manufacturers and designers are facing during production. At the end of the post, readers can find actionable tips for choosing between a wide or narrow beam LED luminary. Request for powerful narrow beam LEDs is on the rise. A wide range of businesses and facilities depend on sharp lighting configurations to illuminate specific targets in a location. In industrial warehouses, such as Amazon’s fulfilment and processing center, narrow beam LEDs are preferred when illuminating tight aisles with high ceilings. Naturally, the higher the ceiling, the harder it is to maintain a sharp, quality beam. In warehouses, high ceilings are the norm because businesses store goods vertically in order to maximize space. So by installing extremely narrow LEDs in the facility, companies can decrease the space between each aisle, and ultimately fit more products in the warehouse. Lift trucks, forklifts and Very Narrow Aisle (VNA) vessels that operate in spaces less than six feet across using robust guidance devices can also navigate the facility safely and more accurately with help from such lights. Residential and mainstream commercial spaces may also use narrow beam LEDs both indoors and outdoors. Inside an office or home, narrow beam fixtures may be installed over an area where detailed work is conducted, such as a table, workstation or kitchen counter. In outdoor lighting systems, narrow beam LEDs may be used to light up monuments, trees, walls and dark areas for added security. In the commercial art sector, narrow beam LEDs are being used to illuminate ornaments, displays and paintings during exhibitions. For example, such fixtures may be utilized to light up a small pottery artifact on a stand. With the LED installed above the artifact on the ceiling, the beam pointing downwards should be tight and bright with minimal light spillage outside of the beam. Furthermore, the LED should be able to maintain its color temperature and brightness levels (no flickering). In this industry, there are needs for narrow lighting, as narrow as four degrees. Designing narrow beam LEDs is no easy task for lighting manufacturers, because compact light sources and larger optics are needed to produce efficiently narrow beams. High-quality optics are required to ensure consistent performance, which can be difficult for directional light sources that emit light at 180-degree configurations, like LEDs. According to Nadarajah Narendran, Director of Research at the Lighting Research Center (LRC) in New York, poorly designed primary optics (lens or casing) can cause a fixture’s performance to decrease up to 70 percent. The main issue with most LEDs is their broad lighting configurations, despite being concentrated during output. 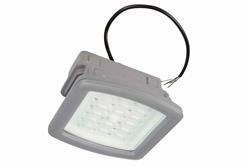 This is not suitable for lighting over great distances, because the light loses intensity. To fix this issue, manufacturers apply a set of secondary or external optics, such as reflectors, total internal reflection (TIR) optics, diffusers or magnifiers. Reflectors, being one of the cheapest and easiest optical features to implement, accurately aligns light and improves beam uniformity. The effectiveness of a reflector depends on several factors, including its closeness to the LED package. By comparison, TIR optics are composed of a refractive lens coupled with a reflector. Such components are usually shaped like a cone and can reach up to 92 percent optical efficiency. Currently, narrow beam LEDs that use TIR optics can produce beams as narrow as three degrees. The combination of secondary optical features applied by the manufacturer may determine its narrow lighting capabilities during operation. But some highly competitive, forward-thinking manufacturers are going beyond this practice by designing narrow beam LEDs without external or secondary optics. New designs that incorporate angled reflective surfaces and uniquely shaped encapsulates are being applied to aggressively manipulate light and tighten the beam angle, resulting in a simpler, sturdier design. Choosing between a wide and narrow beam LED requires a general understanding of various working components during illumination. First, a beam angle is the measurement between two end points on the axis of the beam where light intensity hits 50 percent of its maximum. With that in mind, a narrow, 25-degree light beam is a spot (used in LED spotlights), a 60-degree light beam is a flood (used in LED floodlights) and wider beam configurations exceeding 60 degrees is known as a wide flood (used in wide LED floodlights). A common mistake that buyers make is choosing a wider beam angle for spaces that need more light. It is crucial to consider that wider beam angles only spread out or distribute more light and does not provide extra brightness features. Luminaries with wide beam angles are ideal for (residential and commercial) lounge areas, open floor plans, hallways and rooms where basic tasks are performed, such as reading, relaxing or watching TV. Fixtures with wide light beams are typically installed further apart, compared to lights with narrow beams. They also spill more light outside of the beam. Narrow beam LEDs must be applied in rooms that require controlled lighting configurations. As mentioned earlier, it is common to find such lights in areas where complex tasks are performed. In rooms with high ceilings over 2.4 meters, narrow beams are needed to push light through the space. To summarize, factors that one should take into account when committing to an LED beam angle includes the following: personal preference, height of ceiling, tasks to be carried out in the space and distribution of light fixtures. When in doubt, consumers may start with a beam angle of 35 to 45 degrees, which works well in most conventional, mainstream spaces; and possibly move on to more specific beam configurations, based on the factors mentioned above.